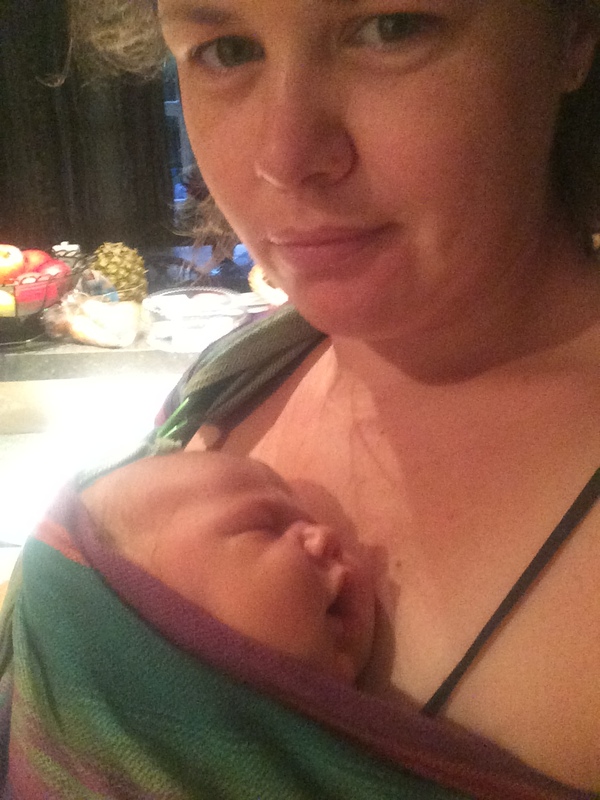 A ring sling is probably one of my most ustilised and favourite of all the carriers… There is a perception that because of the one shouldered nature they are only good for a certain timeframe or if used in a certain way. Turns out my hesitation wasn’t necessary though. I guess I felt validated the way I have been using it this whole time is essentially pretty close to the method I would use to show someone.. There where tips and tricks about making processes and understandings clearer for teaching (like “the price is right” and “sunrays”) and new ways to use one of my most prized parenting tools since my little dude was born. I learnt many cool things at the training, about ring slings alone. For something I felt I already really had a grasp on, it was eye opening. I haven’t actually used a ring sling the same since we did this training module. The process also inspired me to view my ‘prior knowledge’ about carriers differently and to experiment outside the ‘rules’ more.. If you want to learn more about the various ways and techniques to use your ring sling, check out your local sling meet or contact me for a ‘skills development based’ workshop or Skype consultation. You could also come along to a workshop at MAMA Maternity, next one is this coming Monday, 26th September, 2016 at 1030am-12pm (https://www.facebook.com/events/664969533661104/). Categories: Babywearing Solutions, fancy finishes, Sling & Carrier Consultants, Slingababy Training | Tags: adaptations, ring sling, skill development, workkshops | Permalink. I am a massive ring sling fan, I have worn one pretty much everyday for over the last year! My first open tail woven converted ring sling was a Girasol Saltillo which I got when Josh was 18 months old. It was the first ever thing I wore Jai in only a few hours old! 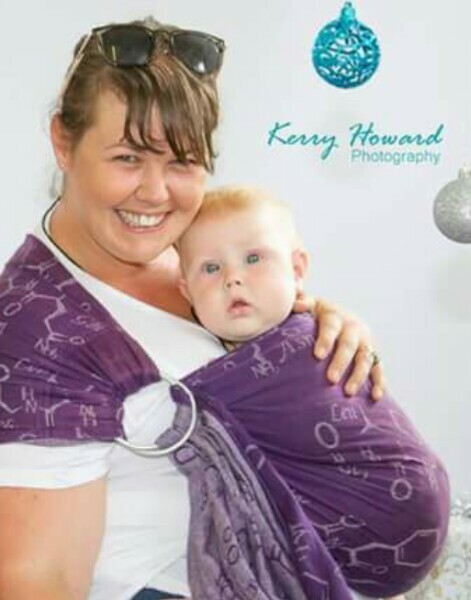 Not long after he was born and I realised how much of a ring sling fan I was, a friend and I went halves in getting a Natibaby Oxytocin wrap converted into a ring sling by K.I Designs. It is a cotton/hemp blend and the extra stiffness and bulk added by the hemp has completely softened after a year of use! It is my go to ring sling, partly because of the wrap having a “right” and “wrong” side (different look to the print), which makes it easier to spot which way is up and avoid getting myself twisted or tangled with quick ups and downs. 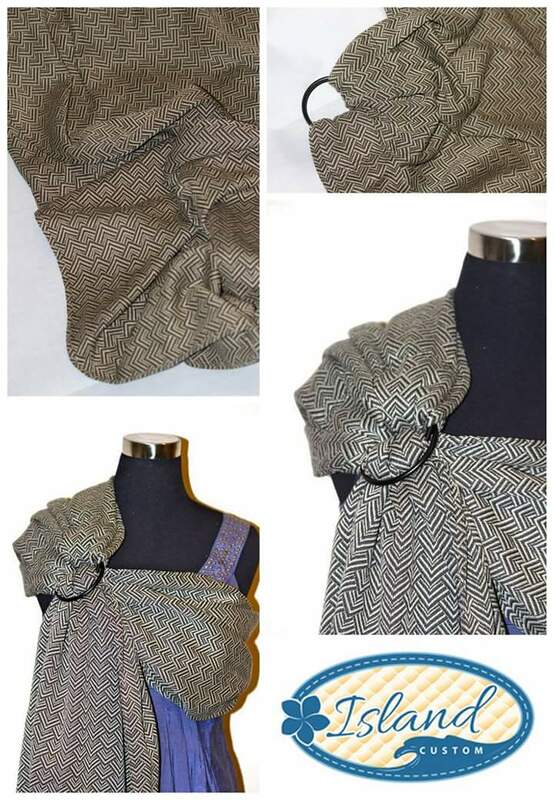 So I recently purchased a heavy duty woven wrap that had been made into a ring sling, Poe Chevron converted by Island Customs, as part of a fundraising auction for a new babywearing group being established in Geraldine, a small town down the line in the South Island of New Zealand. I knew it was a heavy duty wrap before purchasing it, Poe Chevron is a 425 g/m2 wrap, the weave is made of four different threads, as opposed to two in a standard Poe woven. It is noticeably thicker and heavier than a standard woven wrap. 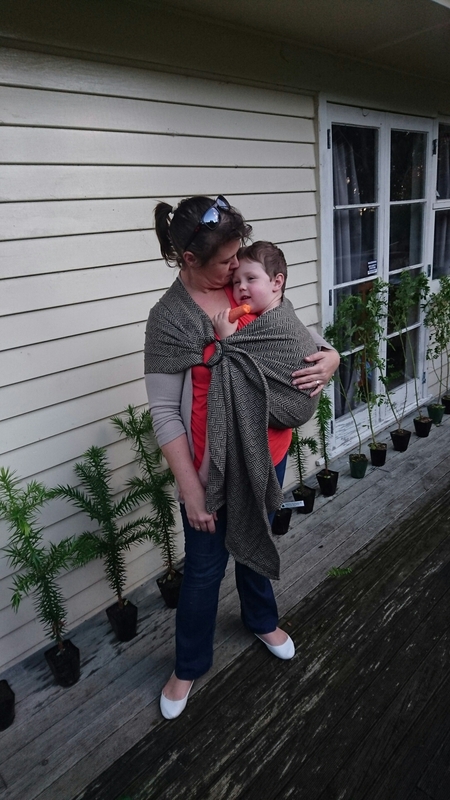 But Poe Chevron is a whole different ball game, and as I blogged about recently, my go to approach of a wrap hammock to soften and break in my wraps with my kids help, isn’t going to work the same with a ring sling! First, and this is seriously essential, you need to wash your wrap. When wraps arrive new to you, they are often in what is called “loom state”. They have just come off the loom, the weave hasn’t had a chance to settle into place. It is wise to always check the care instructions for your particular wrap on the manufacturers website or in an instructional booklet if you have one, even wraps of the same blend may require different care so it’s safest not to assume anything and double check! So in this case, following the guidelines on the Poe website, I used a cold wash on a delicates cycle and liquid detergent. 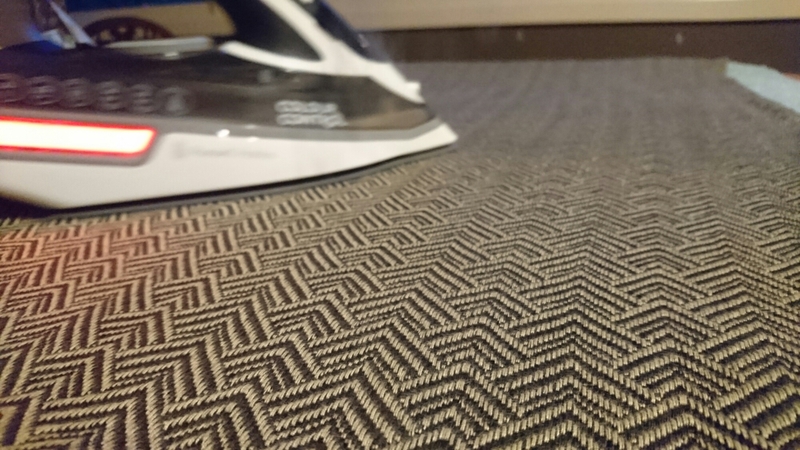 I then tumble dried and gave it a through steam iron on the cotton setting. Once I had done those steps, it already felt a little softer and mouldable.. But the thing with a ring sling is you are pulling a piece of material, in this case 66cm wide through and between two metal rings, which in this case are about 8.5cm in diameter. There is always going to be some “work” required to soften up that gliding action of the material through the two rings. The best way to soften or ease that process is by doing it really… Today we had a movie afternoon because we were all feeling average after a long week. So after Mr 3.5 and I went to the video shop and got some DVDs, we sat on the couch together, and while we watched, I sat and pulled the material through the rings and back again. This is a seriously heavy duty wrap, despite changing sides and taking a break, my arms where sore after a while!! So I resorted to an alternative approach of tightening and loosening it as I was wearing it (thanks again Jai for your hands on help with that video hahah). Categories: Babywearing Solutions, Ring Slings, Woven wraps | Tags: breaking in, Poe Chevron, ring sling, softening, woven wrap | Permalink.